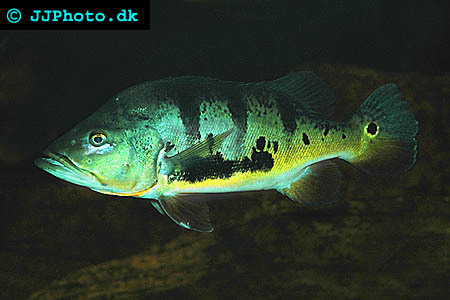 Cichla species can be breed in large aquariums and ponds. They are very productive and one spawning can result in up to 10 000 eggs. 2000-3000 eggs are however a more common result of a successful Cichla spawning. Cichla species grows very fast and reaches sexual maturity and a length of 25-30cm / 10-12 inches in their first twelve months. (Figures are for male Cichla females are usually smaller and needs up to 24 months to reach sexual maturity) Male Cichla specimens often develop a large hump on their heads and the fishes can be sexed using by this hump. Other ways of sexing Cichla specimens are to look at their genital and by the fact that males usually are larger then females of the same age. The best way to get a Cichla breeding pair is to get a group of young fishes and to let them form pairs as they grow up. The other fishes can be removed when a pair has been established. They spawn on flat surfaces that have been cleaned in advance and both parents protect the young. Cichla species are usually very good parents. They usually protect their young for up to nine weeks (sometime only 4) after which the fry has reached 2.5-3 cm / 1-1.25 inch. It is best to remove all but a few fry before this time since the parents will chase the fry away at this time and may kill them if the aquarium is to small for the fry find hiding places outside their parents territory where the parents is starting to prepare for the next spawning. The fry would in the wild at this time move into shallow vegetated areas close to the water bank. The fry is fast growing and is best feed newly hatched brine shrimp during the first days and can later be feed small frozen food and mashed pellets. The fry can be raises separated from their parents but you should always leave some of the fry in the parents care to allow them an out lop for their parental instincts. Breeding pair can begin to fight of all fry are removed. Fry are best raised in a well planted aquarium similar to the shallow areas they would grow up in if they still were in the wild. The fry grows in different rates and male’s fry grow faster then female fry. This means that you have to sort the fish according to size to prevent these highly predatory fishes to eat each other. Make sure that the aquariums containing the growing fry have a lot of hiding places where weaker fry can find a place to rest. An alternative can be to keep a high number of fry together in an aquarium to try to reduce aggression. The parents are very aggressive during the breeding period.